All of your favorite zoosters are back as Marty, Alex, Gloria and Melman make their way back home to New York City by joining a traveling circus to blend in as they cross Europe. But a pesky French animal control officer and their new circus friends create hilarious European adventure unlike anything you’ve ever seen. Featuring a sensational, all-star cast of voice talent including Ben Stiller, Chris Rock, David Schwimmer, Jada Pinkett Smith, Sacha Baron Cohen, Cedric the Entertainer, Martin Short, Bryan Cranston, Jessica Chastain and Frances McDormand, MADAGASCAR 3: EUROPE’S MOST WANTED delivers hysterical entertainment that the whole family can enjoy. We had the opportunity to actually see this movie in theatres this past Summer and absolutely loved it, so when the chance to review it came up I couldn't pass on it. We watched this over the weekend and just like we remembered the trilogy to one of our favorite family movies ended with a bang. It was hilarious, colorful and filled with a great story line and ended with a happy ending. My kids loved this movie, as did my husband and myself. Along with the movie came the famous wig Marty wore in the movie and I have to say my son enjoyed this more than anything. 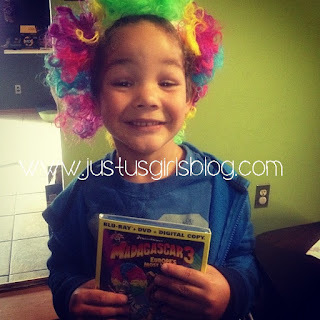 When that specific part in the movie came on where Marty sings, Afro Circus, my little man ran upstairs to get the wig, put it on and sang along with Marty. It was cute and simply adorable and he's been loving it ever since. 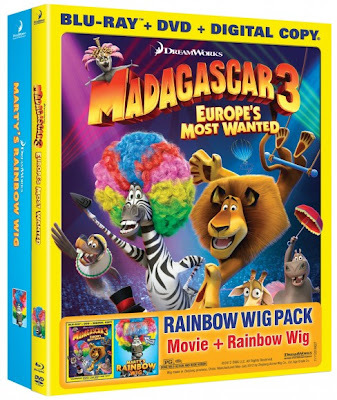 You can now own and bring this trilogy of the Madagascar movies home on blu ray and dvd today! Also enjoy and share these travel tips from Alex and Marty. These two have had tons of traveling experience! Disclosure: All opinions are my own. I received Madagascar 3 at no cost for the purpose of this review. No other compensation was received.